According to the world’s most downloaded Bible app, YouVersion, the most popular Bible verse of 2018 is found in the Old Testament. Isaiah 41:10’s “Do not fear…” verse was shared, bookmarked, and highlighted more than any other passage by hundreds of millions of YouVersion users. Persecuted religious minorities victimized by Islamic State (ISIS) in Iraq and Syria are now set to get some relief from the U.S. government. Congress unanimously passed a law designed to provide aid to Christians, Yazidis, Shia Muslims, and other religious minorities that underwent displacement and genocide at the hands of ISIS. An Illinois town canceled a trip to KY’s Creation Museum and Ark Encounter after an atheist group filed a complaint. Charleston’s parks and recreation department cancelled the trip for its community after the atheist group argued that the trip violated the Establishment Clause of the First Amendment. A Michigan civil rights group is threatening to sue the Newaygo Public School District if they do not remove a Wise Men display from an elementary school building, citing it to be a violation of the US Constitution. Most citizens of the small Michigan town, however, support keeping the display, which has been part of Newaygo’s Christmas tradition since the 1940s. The numbers may be surprising. A people who claim generous giving as a way of life, with the biblical standard of 10% as their benchmark, give only about 3% of their income to charitable causes, including their local church. 12% qualify as tithers, giving 10% or more of their income to their church (or other organizations), according to researcher George Barna. So, what’s the disconnect? We talk about tithing. We teach tithing. But many believers don’t tithe. Why? And here’s a better question: What’s at stake if we don’t give generously? The play is complete, the ball is down, but the purpose of the next play is unclear. If the football has been moved 10 yards, it’s a first down and the offense gets to start counting its march downfield from its new vantage point. If not, the play could be the last, for now. Ground gained could be lost. 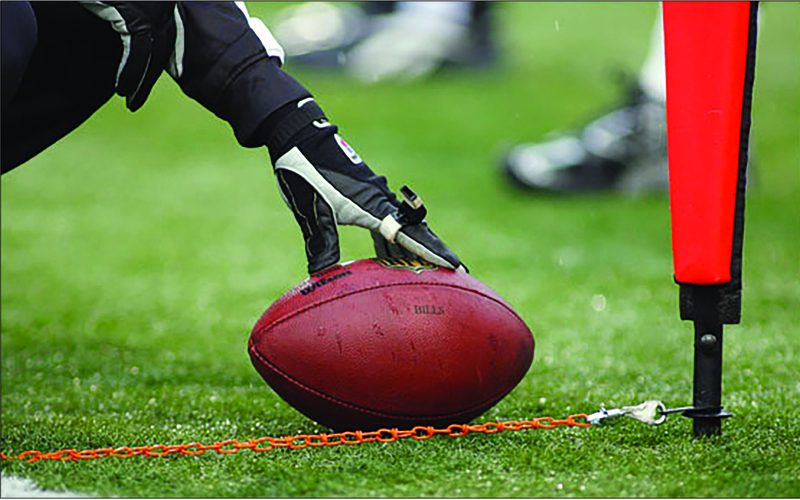 So the chain gang comes in from the sidelines to measure the advance of the ball. Was it 10? Is the offense positioned to start another advance? Similarly, in ministry, gospel advance is often determined by the resources available to move the mission forward. And month after month, we call in the chain gang to measure our progress financially. Sometimes we pass the line. At issue is how we teach people to give, and how we budget based on those expectations. Many evangelicals have a firm commitment to tithing as a New Testament command. Tithing is commanded in the Old Testament. In fact, multiple tithes are collected from the Israelites to support the priests, the temple, and the poor. It is the prophet Malachi who puts the sharpest point on the one-tenth rule: “Will a man rob God? Yet you are robbing Me!….By not making the payments of the tenth and the contributions. You are suffering under a curse, yet you—the whole nation—are still robbing Me. Bring the full tenth into the storehouse so that there may be food in My house. Test Me in this way,” says the Lord of Hosts (Mal. 3:8-10, HCSB). When Jesus speaks about giving 400 years after Malachi, the tenth is assumed (Matt. 23:23). But Jesus, criticizing the legalistic actions of the Pharisees, expresses concern about the heart in giving. And Paul prescribes giving that is compassionate, generous, systematic, and regular (1 Cor. 16:1-2). Some would argue that the tithe is still in place for New Testament believers, that it is still a command. Others contend that, free from Law, the tithe becomes a benchmark for believers who choose to give, and that the command is instead generosity. “I am very direct about preaching and teaching on generous giving,” said Doug Munton, pastor of First Baptist Church of O’Fallon. He holds up the tithe as the standard. “I have tithed and beyond all of my life and this is extremely valuable to my spiritual life. I preach on the importance of a generous life. Both Munton and Price preach regularly on giving. Munton leads an annual stewardship emphasis. And Price returned to a financial series after a two-year break when he was encouraged by church leaders to address the issue again. And the results? “We have definitely seen an increase in giving in the past several months,” Price said. The head of an organization called Generous Giving, Brian Kluth, says pastors can’t be shy about teaching on money. “We need to learn to be open-handed people in a tight-fisted world.” Kluth had considerable success as a pastor leading his Colorado congregation in giving. “Every time you give to the Lord, you are declaring who your source is, who your help is,” Kluth said. But, he admits, it will take support from the pews to overcome reticence to address money issues. “Lead the way laypeople, encouraging your pastor to preach on tithing and generosity. Encourage and defend him both privately and publicly,” Floyd wrote. Floyd’s comments come as the SBC strains to rebound in Cooperative Program giving to missions, and to answer long-term questions about funding for SBC missions on all fronts. The potential for gospel advance would be almost unimaginable, if the biblical standards for generosity were heeded. What if we all tithed? Empty Tomb, Inc., a Champaign-based research firm, asked this question when average giving by church members was at its lowest point in their annual surveys (2.46% in 2008): What if all givers tithed? The researchers projected that if every church member in the U.S. gave 10% rather than the average 3%, the additional amount available for kingdom work would be $172-Billion. Meanwhile, the ball moves ahead in fit and starts, while the measuring gang rattles the chains on the sidelines. Eric Reed is editor of the Illinois Baptist where this article first appeared in the September 21 issue. Read the Illinois Baptist online now. Recently a bivocational pastor shared with me a difficult decision he needed to make, whether or not to stay as pastor of the church he was serving. He had already accepted the reality that the small church could not afford both his insurance and a full-time wage, and that he needed employment outside the church to support his family. What seemed to have him questioning whether he could stay were recent remarks by a couple of his church members. I could hear the hurt in his voice, and read the disappointment in his face. He was still a few years away from retirement, and had recently lost his job outside the church. At a time when being valued by the church was very important to him, a couple of unthinking church members had made him feel less valued than ever. After a few minutes of talking it through, it seemed clear to me that the pastor was going to stick it out. He loved his congregation, and I suspect that even the ones who made the hurtful statements loved him. But he and I agreed that if he was going to feel appreciated, and perhaps even more importantly, if his people were to have their hearts matured and transformed into generous, godly givers, that he needed to provide some candid teaching, and loving but direct conversation, on tithing and giving. They could be referring to a mission offering, or the Cooperative Program, or the local association, or any ministry where the investment is largely in people that are doing ministry among and on behalf of the churches. If there’s not some direct, tangible benefit back to the church, the value is questioned. “If they aren’t here, helping us, maybe they don’t deserve our support.” If the sermon isn’t preached, the ongoing, continual ministry of the pastor isn’t valued. The next Sunday after that conversation, a snowstorm hit here in Springfield. Several area churches cancelled services, but our church did not. With that pastor’s pain still in the back of my mind, I got up early to clear the snow from our driveway, and make sure we could get to church. As we headed out the door, I asked my wife to make sure we had our offering envelope with us. I remembered in a fresh way that our tithe was the Lord’s, and that our church’s staff and ministries count on our support, whether we’re there benefitting from them or not. I also remembered that the portion of my weekly offering that goes through the Cooperative Program supports thousands of missionaries and other ministries that operate literally around the clock and around the world. The Lord and they are at the heart of my giving, not the benefits I receive. And I’m grateful for each one of you that feels and gives from that heart too.